“”Magnetism, as you recall from physics class, is a powerful force that causes certain items to be attracted to refrigerators. Geomagnetism refers to the Earth's magnetic field, which extends from the Earth's interior to where it meets the solar wind. Roughly speaking, it is the field of a gigantic bar magnet currently tilted about 10 degrees off the Earth's rotational axis. Unlike a bar magnet, however, the Earth's magnetic field changes over time, because it is generated by a geodynamo (in Earth's case, the motion of molten iron alloys in its outer core). Relatedly, geomagnetic reversals are shifts in Earth's magnetic field in which the positions of the magnetic north (positive) and south (negative) are switched. In modern times, a reversal has usually occurred every 50,000 to 800,000 years, with an average of 200,000 years. A plethora of scientific evidence supports the existence of geomagnetic reversals. Due to their long timeframe, several young earth creationists (YECs) have attempted to deny the standard scientific picture of geomagnetic reversals. Early creationists simply denied that geomagnetic reversals had occurred; later creationists, facing the solid evidence for their existence, have been forced to retreat to Goddidit. Geomagnetism and geomagnetic reversals are supported by several threads of evidence. This occurs because magma contains iron grains (specifically magnetite) that orient themselves towards the magnetic north pole, much like a compass. When lava solidifies, the iron grains are no longer able to move freely, and are permanently aligned towards wherever the magnetic north pole was. Thus, when magma from oceanic trenches hardens into seafloor, it will maintain its magnetic alignment. Because stripes of the same number of magnetic reversals away from oceanic trenches are uniform in age, it is clear that this is a global event, which can only be explained by something like a geomagnetic reversal. The theory of seafloor spreading is supported by the existence of symmetrical (in age, polarity, and distance from mid-ocean trenches) magnetic stripes in the rock of the ocean floor. No other theory can explain why these stripes exist at all or their symmetry, making this strong evidence for seafloor spreading. This, in turn, supports the existence of geomagnetic reversals. If the Earth's magnetic field was freely decaying (nothing added to its strength, so it slowly died) then it would decay in about 20,000 years. Since we know that the magnetic field has existed for at least 3,000,000,000 years, a theory is needed to explain how the Earth's field regenerates that also can explain the existence of geomagnetic reversals, local fluctuations in the geomagnetic field, and various other magnetic phenomena. The Earth's core is filled with moving, liquid metal that is constantly flowing. Heavier and cooler metals settle onto the Earth's core, while lighter and hotter metals rise, making a gigantic convection current , which, due to its metallic contents, gives rise to a magnetic field. The Earth spins on its axis, which puts Coriolis forces onto the core, which forces it to spin and to shear through the previous magnetic field, which generates a new one, which keeps the field as a whole alive. The simulated field's strength matched the observed field's strength. The simulated field's westward pole drift matched the observed field's westward pole drift in direction. 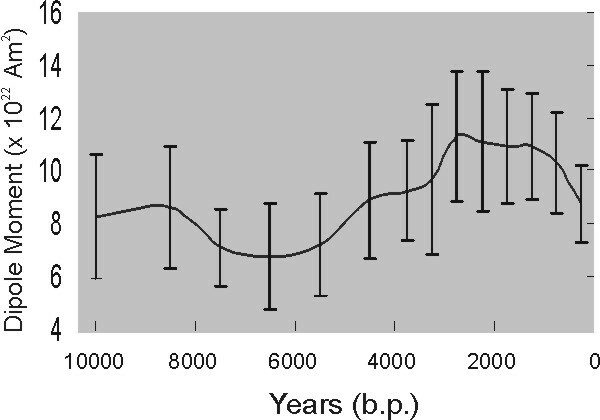 The simulated field had polar reversals in ~100,000 year intervals that matched the observed field's reversal timeframe. Our solution shows how convection in the fluid outer core is continually trying to reverse the field but that the solid inner core inhibits magnetic reversals because the field in the inner core can only change on the much longer time scale of diffusion. Only once in many attempts is a reversal successful, which is probably the reason why the times between reversals of the Earth's field are long and randomly distributed. While geodynamo theory is not yet perfect, it very accurately describes the Earth's magnetic field and has no real competitors. Because the strength of the geomagnetic field is currently declining, it has become the center of some woo. It is believed that a reversal or excursion (basically a reversal, with associated decrease of strength, minus the polar flip) may be imminent in the next couple of thousand of years or so. Reversals do have an impact. For example, during the most recent reversal, the Earth's magnetic field reduced to 5% of its original strength. A small amount of Earth's atmosphere, usually protected by the Earth's geomagnetic field, can be lost to space due to radioactive bombardment from the sun. On the whole, however, reversals appear to be relatively harmless to living beings. Considering that around 170 to 171 reversals are documented in the last 76 million years alone, reversals don't seem to pose much of an extinction-level threat. Some cranks, including Robert W. Felix, believe that geomagnetic reversals cause ice ages and extinctions that lead to "evolutionary leaps". While both are possible, both are rather unlikely. As pointed out above, geomagnetic reversals don't seem to have impacted life on Earth much in the past 76 million years. A geomagnetic reversal is not a pole shift. In a geomagnetic reversal, the magnetic poles are flipped. In a pole shift, the planet itself is flipped -- the Arctic located where the Antarctic is, and vice versa. This theory has essentially no scientific consensus, but is pretty badass. The age of any reversal can be estimated by extrapolation along the sea-floor magnetic strips, assuming constant spreading rates, once a reliable chronology is constructed for a portion of the strip. Such a reliable chronology has been constructed for the most recent segment — up to 5 million years ago. And, beyond that, around 171 reversals are geologically documented, which would make the Earth at least 8.5 million years old. Geomagnetic reversals, given their known larger-than-10,000-years timeframe and their support for much-slower-than-10,000-years seafloor spreading and plate tectonics, present a problem for young earth creationism. The Solution: Accept that creationism is flawed Deny, deny, deny! Some young earth creationists, such as Walt Brown, Thomas Barnes, Kent Hovind, , the ICR, and CMI's 101 evidences for a young age of the Earth and the universe (numbers 49, 69, 70, 71, and 81) argue that the geomagnetic field has only (or with slight variation in speed) decayed for the past 6-10,000 years; geomagnetic reversals would contradict this worldview. Depending on the level of denialism, many creationists either deny that the data exists or consider them to be past fluctuations in the overall high strength of the geomagnetic field. Why? Because, based on the decline of the magnetic field in the past century or two, they believe that the magnetic field has been in constant, exponential decline, forever. Extrapolating exponentially backwards, YECs conclude that the Earth cannot be more than 20,000 years old, because that would imply that the Earth's magnetic field would be impossibly large. This assertion has numerous problems. First, this idea assumes that current decay rates of the Earth's magnetic field have remained constant and exponential for all time, which can be seen in the lower image on the right. Evidence contradicts this assumption. As shown in the upper image on the right, the geomagnetic field frequently both increases and decreases in strength, with no clear trend either way, which directly contradicts the predictions of this model. Further, as shown earlier, during geomagnetic reversals and excursions, the strength of the field significantly decreases; during the most recent reversal, the Earth's magnetic field reduced to 5% of its original strength. The Earth's geomagnetic field is believed to be currently undergoing a reversal or an excursion, which would account for the decrease of the strength of the field. This means that the decay rate cannot be assumed to be, in fact, constant, and thus the proposed timeframe of this model cannot be accepted. The dynamo theory has gained near-universal acceptance because it is the only proposed mechanism that can explain all the observed features of the Earth's magnetic field. In contrast, Barnes' hypothesis of a freely decaying field cannot explain the existence, configuration, movement, or changes in the nondipole field, the fluctuations in the dipole moment, the reversals in field polarity, or the documentation in the geologic record of the continued existence of the field for more than three billion years. In short: the idea is so terrible that fellow Young-Earth Creationist Russel Humphreys presents arguments against a pure free-decay model. Thomas Barnes also advanced the claim that, instead of global geomagnetic reversals, which require a long time and repudiate a YEC model of the Universe, the reversals that we see were actually local geomagnetic variations, which can occur quite quickly and allow room for a YEC universe. Evidence flatly contradicts this claim. The ages of magnetic stripes on both sides of the Atlantic Ocean and all over the world match. This would only occur if all of these locations had experienced the same magnetic field at the same time, which would be incredibly unlikely if magnetic reversals did not occur on a global scale. This indicates that reversals are not local fluctuations, but global events. Modern YECs, such as Russell Humphreys and CMI (101 Evidences, numbers 46 and 47) generally accept that geomagnetic reversals exist and have occurred. Rapid reversals aren't completely impossible. God reversed the field 50 times during the Flood. … And that's it. Until science is willing to accept "And then a miracles happens" as a plausible explanation for something, this theory is pretty much worthless. Images of geomagnetic timescales back to 80 million years ago. See the Wikipedia article on Earth's magnetic field. See the Wikipedia article on Geomagnetic reversal. We do not need to assume that the drifting of the continents has been at a constant rate over the past 200 million years, for we have a magnetic record of their movements. The molten rock that oozes up in the Mid-Atlantic Ridge is partly magnetized by the magnetic field of the Earth, and as the rock cools that magnetism is frozen into it. We can measure the magnetic polarity of the rocks in the sea floor with delicate magnetometers towed on the ocean surface. This would, of course, not be interesting if it were not that the magnetic field of the Earth reverses itself every half million or so years; in fact, in the past 76 million years, it has reversed itself 171 times. Ocean floor rocks close to the Mid-Atlantic Ridge carry the magnetism of the present field, but those several miles away on either side have the reversed magnetic polarity of the field of the earth half a million years ago, and those still farther have the polarity of the still earlier field, and so on. Over recent geological times the alternating polarity of the magnetism in the ocean for has reversed many times in consort with the changing field of the Earth. Moreover, this pattern of field reversals is consistently reproduced in the ocean floor in widely separated regions of the Earth. But how do we know the dates of the magnetic field reversals in the ocean floor? The age of any reversal can be estimated by extrapolation along the sea-floor magnetic strips, assuming constant spreading rates, once a reliable chronology is constructed for a portion of the strip. Such a reliable chronology has been constructed for the most recent segment — up to 5 million years ago. It is based on direct radiometric dating of sequences of lava flows. ↑ Quotemined? Yes, marginally. Still true? Hell yes. ↑ "Magnetism, as you recall from physics class, is a powerful force that causes certain items to be attracted to refrigerators." Just-One-Liners.com. n.d. Web. 04 June 2014. ↑ 2.0 2.1 2.2 2.3 2.4 2.5 2.6 "Reversals: Magnetic Flip." Natural Environment Research Council. n.d. Web. 04 June 2014. ↑ 3.0 3.1 3.2 3.3 "Magnetic Striping." Prince William Network. Our Changing Continent. n.d. Web. 28 June 2014. ↑ 4.0 4.1 4.2 4.3 4.4 4.5 Roach, John. "Earth's Magnetic Field Is Fading." National Geographic Society. 09 September 2004. Web. 04 June 2014. ↑ 5.0 5.1 5.2 5.3 5.4 5.5 5.6 Rosenberg, Matt. "Magnetic Reversal." About.com. n.d. Web. 05 June 2014. ↑ 6.0 6.1 6.2 6.3 6.4 6.5 "Seafloor Spreading Activity." NOAA. 12 February 2013. Web. 28 June 2014. ↑ 7.0 7.1 7.2 7.3 7.4 Isaac, Mark. "Claim CD741." Talk.Origins Archive. 13 February 2004. Web. 28 June 2014. ↑ 8.0 8.1 8.2 8.3 8.4 8.5 8.6 8.7 8.8 Laurie R. Godfrey (1983). "Scientists Confront Creationism". W. W. Norton & Company, Canada. Pages 36-37. ISBN 0393301540. ↑ 10.0 10.1 "Ice age polarity reversal was global event: Extremely brief reversal of geomagnetic field, climate variability, and super volcano." Helmholtz Centre Potsdam. 16 October 2012. Web. 04 June 2014. ↑ 15.0 15.1 15.2 Major, Trevor. "The Earth's Young Magnetic Field." Apologetics Press. 1993. Web. 04 June 2014. ↑ 16.0 16.1 16.2 16.3 16.4 Isaac, Mark. "Claim CD701." Talk.Origins Archive. 12 May 2006. Web. 28 June 2014. ↑ 17.0 17.1 17.2 17.3 Matson, Dave. "How Good Are Those Young-Earth Arguments?" Talk.Origins Archive. 2002. Web. 03 July 2014. ↑ Barnes, Thomas G., 1982 (Aug.) Young age for the moon and earth. Impact 110. ↑ Robbins, Stuart. "Does Earth's Decaying Magnetic Field Mean It Was Created 6,000 Years Ago?". 09 August 2011. Web. 28 June 2014. ↑ 1992. "Can Earth be Dated from Decay of its Magnetic Field?" NCSE Reports, Vol.12, No.1 (Spring 1992), pp.16-17 National Center for Science Education, P.O. Box 9477, Berkeley, CA 94709-0477. ↑ 23.0 23.1 "Seafloor Spreading." Prince William Network. Our Changing Continent. n.d. Web. 28 February 2014. This page was last modified on 17 August 2017, at 06:57.